Ever more confident against the defensive art, Japan’s Kasumi Ishikawa won the Women’s Singles title at the Seamaster 2018 ITTF World Tour Platinum German Open in Bremen on the afternoon of Sunday 25th March. The no.2 seed, she overcame the backspin skills of Suh Hyowon, the no.14 seed in what was a very different contest the one and only other occasion when the two had met in an ITTF World Tour Women’s Singles final. 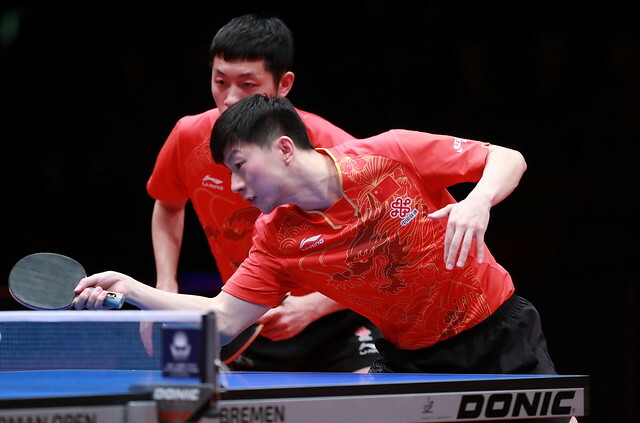 Memorably, in 2013 in Korea, they had contested the title decider, in a dramatic seven games encounter Suh Hyowon had won by the minimal two point margin; on the next occasion when they met, the 2014 Asian Games, the decision had also gone the way of the Korean but ever since that encounter, six in a row, Kasumi Ishikawa had prevailed. In Bremen, Kasumi Ishikawa increased the series of wins to seven; she prevailed in five games (11-9, 10-12, 11-6, 11-7, 11-6). Cautious, Kasumi Ishikawa won the first game after Suh Hyowon had saved one game point at 10-8; it appeared that Kasumi Ishikawa would extend the advantage. In the second game, as in the first, she led 10-8 but then promptly lost the next four points. More than in the past Suh Hyowon changed from defence to attack, it posed problems for Kasumi Ishikawa; once Suh Hyowon was back from the table in backspin mode, Kasumi Ishikawa was comfortable. Stung by the second game reverse, Kasumi Ishikawa dominated the third, gaining success on her third game point. Now more assured and above all more patient than at the end of the second game, she established an early lead in the fourth game but then lost four points in a row to reduce the advantage to two points at 9-7. Prudently, Kasumi Ishikawa called “Time Out”; the break worked she clinched the next two points. Kasumi Ishikawa was now in control, she moved ahead 8-5 in the fifth game, Suh Hyowon called “Time Out”; it was a desperate move. At 10-5 Kasumi Ishikawa held five match points, at the second attempt she converted. Thus it was more success for Kasumi Ishikawa in the country where last year, partnering Maharu Yoshimura, she had won the Mixed Doubles title in Düsseldorf at the Liebherr 2017 World Championships. Furthermore, she became the third Japanese player to win the Women’s Singles title at an ITTF World Tour tournament in Germany; likewise in Bremen, Sayaka Hirano had won in 2009, Mima Ito in 2015. Including the engagement five years ago in Korea, it was for Kasumi Ishikawa her 13th ITTF World Tour Women’s Singles final, her eighth win but her first appearance in such a final in Germany. Meanwhile, for Suh Hyowon it was her fifth overall excursion to the title deciding round, her second defeat and déjà vu; the one other occasion was in 2014 when in Magdeburg she had been beaten in the final by Germany’s Shan Xiaona. In Bremen it was same again, just one step short.